Tim Slade further lowered the practice lap record to trump the Shell V-Power Fords in the final practice session ahead of qualifying at the Coates Hire Ipswich SuperSprint. 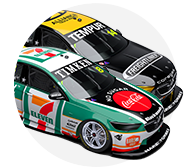 Shell team-mates Fabian Coulthard and Scott McLaughlin had shared the top spot for the bulk of the 45 minutes before Slade set a 1:08.977s with just seconds remaining. Coulthard set an early benchmark before McLaughlin twice went quicker, leaving the benchmark at 1:09.049s ahead of the final runs. McLaughlin looked set to go faster again before making a mistake on the final corner and recording a 1:09.051s before Slade put down the final marker. CLICK HERE for the Practice 3 result. “It was a fairly productive session for us,” said Slade who had been 11th quickest yesterday. “We ran through a good range of things and found a pretty good direction where yesterday we felt a little but muddled and I wasn’t getting the most out of myself either. Shane van Gisbergen was fourth, giving James Moffat a small nudge during the closing stages as the two Holdens battled for space at Turn 4. David Reynolds was among the front-runners throughout and ended up fifth ahead of Lee Holdsworth, Michael Caruso and Rick Kelly. Caruso missed a chunk of the session after his Nissan stopped on track with an electrical issue, causing an early red flag. As usual, tyre condition played a role with McLaughlin saying his time was done on used rubber. 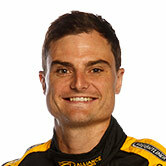 “We used our tyres yesterday, so the car is good,” said McLaughlin, who will be gunning for his 10th pole of the season. Todd Hazelwood shot to third in the closing stages before enduing up ninth, with fellow wildcards Jack Le Brocq and Shae Davies also impressing in 12th and 15th respectively. “We really struggled with a dodgy set of tyres in the first half of the session so we threw the greens on early to get a read on where we’re at,” said Hazelwood. “The car is not great at the moment but obviously relative to the field it’s not too bad. Jamie Whincup’s difficult weekend continued in 16th while fellow former champions James Courtney and Mark Winterbottom were 21st and 24th respectively. Winterbottom’s car underwent an engine change overnight after data showed that the Bottle-O Ford was down on straight-line speed during Friday’s practice. Qualifying will take place from 1330 local time this afternoon.